The imposing bulk of Kawasaki's new VN1700 Voyager Custom has just landed on UK soil, sending a shudder through the large touring cruiser market. But how scared should the American competition be of the new V-twin? 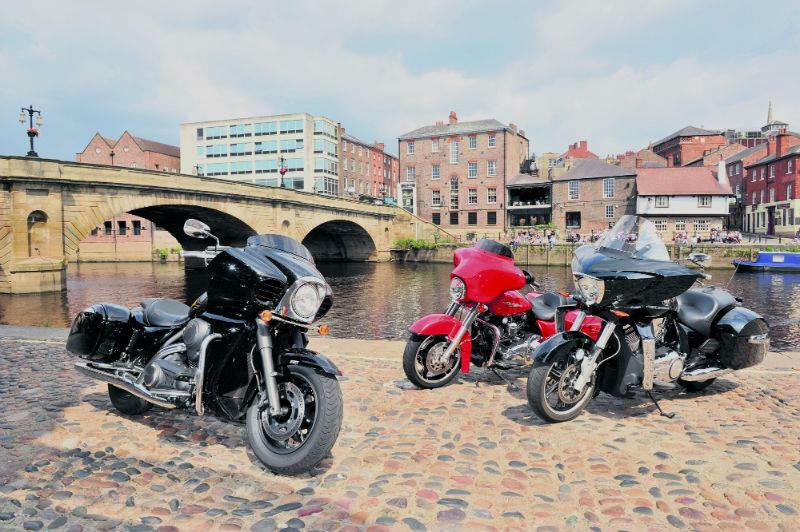 MCN embarked on two days of summer touring to find out, heading north from Peterborough then criss-crossing Yorkshire before ending in historic York. All three V-twins are from the same mould - they're scaled down versions of each manufacturer's ultimate touring machine. Harley-Davidson was the first machine to do this, turning the Electra Glide into the marginally less extreme Street Glide. You still get a stereo, panniers - hence the 'bagger' tag - and lashings of chrome and custom accessories, but it's not too over the top. Plus the screen has been chopped down to give you that wind-in-your-face feeling. Victory followed Harley's lead, turning the outrageously styled Vision Tour into the Cross Country, and Kawasaki have pulled off the same trick by scaling down the full-dressed Voyager into the half-dressed Voyager Custom. Despite all the cooling fins the Kawasaki is water-cooled, and it lacks the chrome bling of the other two. But the largely black finish gives it a mean look, especially when parked next to the garish Harley with its fire engine red paint (it's also available in blue, black and grey). The Harley's classic lines can be traced back to the '50s but it's a little too much 'look at me' for some. The Victory sits on a stylistic fence between the two. Read the full test in this week's issue of MCN (August 24), on sale now. "A scaled down version of their full-dressed Voyager. Meaner, sleeker and £1500 cheaper than the big Voyager"